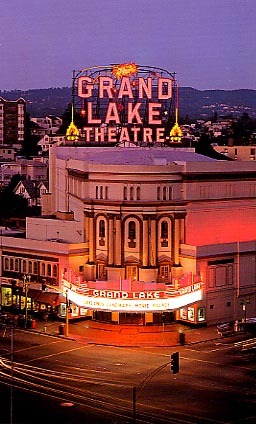 When I was a graduate student at Cal (University of California at Berkeley) in the late 80's, I lived in Oakland, two blocks up the hill from the Grand Lake Theater. I absolutely adored this historic theater and loved to wander up the majestic staircase, inhale the scent of butter and popcorn, take in the deep reds of the long curtains and marvel at the chandelier. This "movie palace" was built in 1926 and retains the grandeur and charm of Jazz Age with live organ performances on weekends. Back in the day, the organ would serve as background music for silent films. I would sometimes sneak into another hall to watch a second movie just so I could stay there longer. A movie that I distinctly remember watching was the sneak preview of Batman. I waited three hours outside the theater for tickets and was part of a huge crowd of fans. A television crew even came to film us lunatics, I mean fanatics. While I waited, I ran across the street to grab a hot dog from an old-fashioned drive-up hamburger stand. Looking at Google's Street View now, that place has been replaced by a KFC. Even stranger for me is the fact that I can see my old apartment from Street View. They installed that reinforcing post on the balcony after the earthquake in 1989. From that balcony, I could see the theater sign blazing at night and the lights of San Francisco in the distance. I didn't particularly like living in California, but this theater is one of the gems of my memories there. Here's a video about the theater with interviews from the owner, organist, manager and projectionist (who doubles as the light bulb changer for the huge sign). There's even a clip of the Star Wars theme played on the organ to delight the audience. I learned that a movie theater makes its money almost solely on concessions as most of ticket sales go back to the studios and the remainder is not enough to keep the lights on. Unfortunately, I was a poor student and couldn't buy any popcorn or candy to support my favorite theater.